London, (UK), January 26, 2018 – Schneider Electric, the leader in digital transformation of energy management and automation, is pursuing its commitment to help reduce energy poverty and provide universal access to environmentally friendly energy, by entering into a partnership with Sustainable Energy for All (SEforALL), a global non-profit organisation. The aim is to accelerate progress towards the United Nations Sustainable Development Goal 7 on energy. 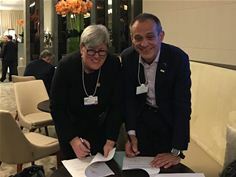 The four-year partnership has been signed on January 23, 2018 at the World Economic Forum Annual Meeting in Davos, by Rachel Kyte, CEO and Special Representative of the UN Secretary-General for Sustainable Energy for All, and Jean-Pascal Tricoire, Chairman & CEO at Schneider Electric. The United Nations sustainable development agenda sets 17 Sustainable Development Goals (SDGs) to achieve by 2030 in order to eliminate poverty, protect the planet and ensure peace and prosperity for everyone everywhere. SDG 7 aims to “ensure access to affordable, reliable, sustainable and modern energy for all” as the prerequisite for child education, quality of life, economic development and effective healthcare systems. While 1 billion inhabitants will continue to rely on dangerous or “dirty” forms of energy by 2030 under current scenarios, SDG 7 aims at closing this gap to reach universal access. SDG 7 also aims to significantly improve energy efficiency and ensure widespread use of renewable energy in the global energy mix. A non-profit organisation is working with leaders in the government, the private sector and civil society to achieve SDG 7. Through this partnership, Schneider Electric is joining forces with companies such as Enel, Iberdrola and Philips Lighting, as well as organisations including the United Nations Foundation and the Global Off-Grid Lighting Association (GOGLA). As a partner, Schneider Electric commits to helping develop and effectively implement four programmes: “Building Efficiency Accelerator”, “Industrial Energy Efficiency Accelerator”, “People-Centered Accelerator” and the upcoming “Electrification Accelerator”, ensuring that the right resources are available. Schneider Electric has already assigned employees to direct each of the four programmes. To support this work, the Group will have access to SEforALL resources, such as its heat maps – a tool to help focus resources for maximum impact across energy access, energy efficiency and renewables. The maps show global progress on sustainable energy based on information from a variety of sources, including more than 80 indicators (the type of energy used, the quality of electricity grids, energy providers, etc.). This partnership with SEforALL reinforces Schneider Electric’s commitment to providing universal access to safe, reliable, efficient and sustainable energy, in line with its sustainability strategy. Since 2005, the Group has monitored its performance on sustainable development through its Planet & Society barometer, which includes an indicator on the number of underprivileged people having received training in energy-related jobs (150,000 people between 2015 and 2017). Sustainable Energy for All (SEforALL) empowers leaders to broker partnerships and unlock finance to achieve universal access to sustainable energy, as a contribution to a cleaner, just and prosperous world for all. SEforALL exists to reduce the carbon intensity of energy while making it available to everyone on the planet.